KNOXVILLE—What works in science and what doesn't and how do we know? As the academic community faces greater scrutiny from external funders as to how and why research or education programs work, the need for external evaluation has never been more apparent. A systems-based model of evaluation considers the organization as a whole, assessing the quality and significance of outcomes while also examining the inputs and processes leading to outcomes. The National Institute for Mathematical and Biological Synthesis (NIMBioS) is now offering a suite of evaluative services to aid scientific research and education efforts. The newly formed NIMBioS Evaluation Services was established to provide independent, rigorous and transparent formative and summative evaluations of both research and educational programs in the STEM (science, technology, engineering and mathematics) sector, particularly programs that are interdisciplinary. "Rigorous evaluation of new approaches in the training of the current and the next-generation of academic students is critical for advancement of student learning in science, technology, and mathematics, and for guiding how to promote interdisciplinarity across these fields," said NIMBioS Director Colleen Jonsson. 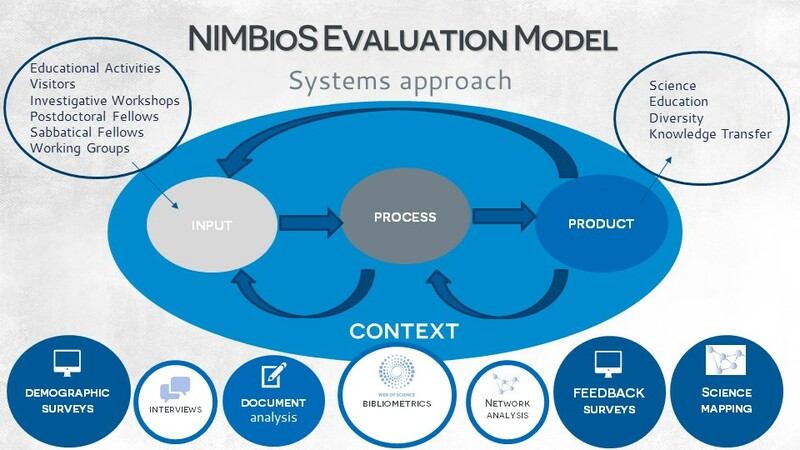 NIMBioS uses a systems-based model of evaluation, which considers the organization as a whole, assessing the quality and significance of outcomes while still examining the inputs and processes leading to outcomes. NIMBioS also incorporates new research methods, such as bibliometrics to analyze publication output, network analysis to examine cross-disciplinary collaborations, and mapping of scientific output, among other methods. Pamela Bishop, an adjunct professor in evaluation, statistics and measurement at the University of Tennessee, Knoxville, leads the NIMBioS evaluation team, which also includes graduate research assistant Lakmal Walpitage and database specialist Ana Richters. A postdoctoral fellowship in evaluation services has also been created. The team has already undertaken several projects, including landing a $299,990 grant from the National Science Foundation to develop a new tool to assess student learning in mathematics. Bishop has been evaluating NIMBioS activities since the institute was established in 2008, which has included more than 150 systematic evaluations. Evaluation of NIMBioS' activities has evolved from formative evaluation of the institute's practices to incorporate how the institute itself has affected interdisciplinary science. One longitudinal study, published in the journal Research Evaluation, determined that during the years in which faculty were affiliated with NIMBioS, they were more likely to collaborate with colleagues and with other institutions, and more likely to form international collaborations. Another study—this one of undergraduate participants in summer research at NIMBioS—found gains in their understanding of interdisciplinary research collaboration. Projects that NIMBioS Evaluation Services is currently collaborating on include one with BioQUEST Curriculum Consortium and the National Association of Biology Teachers to enhance biology faculty collaboration and leadership at community colleges and another project called QUBES ("Supporting Faculty in Quantitative Undergraduate Biology Education and Synthesis" www.qubeshub.com) that provides resources for teaching undergraduate quantitative biology. "We are trying new approaches based on our experience and research, and we need to be able to assess the effectiveness of these approaches," said BioQUEST Executive Director Kristin Jenkins. "It's not enough to say, 'Participants enjoyed it and we think they were transformed.' We also want to be able to strengthen our program by better understanding what works and for whom."